Where is the unnamed isle in The Tempest? The literal-minded will say that it’s obviously in the Mediterranean, where a ship headed from Tunis to Italy might have foundered. Those who know Shakespeare’s written sources will mention Strachey’s 1610 letter and other documents that describe a shipwreck which took place on the coast of Bermuda. Shakespeare seems to have adopted a pick’n mix attitude to the various written sources which he used, including that letter, an essay by Montaigne, Ovid’s Metamorphoses and many others. He’s deliberately contradictory and evasive when describing the magical island, and theatre companies have always grasped the imaginative possibilities it presents. A new production of the play, starring Ralph Fiennes as Prospero, directed by Trevor Nunn, has recently opened in the West End of London. From the photographs and reviews, Nunn seems to have adopted a traditional approach to the design, the recently-shipwrecked Italians dressed in Elizabethan/Jacobean costumes while Prospero and Miranda wear plainer clothes of an indeterminate period. The question of location has, it seems, been left open. In 2006 Rupert Goold took the bold decision to set his RSC production in the frozen north. This seemed to be an eccentric choice. Isn’t the island supposed to be hospitable? Or are we conditioned to think it’s some kind of paradise, like that conjured up by the theme music for the Radio 4 series Desert Island Discs, which beguilingly suggests palm trees, blue seas, and golden sands? Even the characters on the island see it differently depending on their personalities. Of the shipwrecked Italians, Gonzalo and Adrian are positive about their surroundings, while Antonio and Sebastian can see only bad. Goold is undoubtedly a creative force to be reckoned with but he’s gone overboard here…: the feast magically presented to the oppressed travellers …becomes a dragged-on dead whale, yielding bloody, raw meat, and the nuptial masque for Ferdinand and Miranda… is now a faintly ludicrous tribal ceremony involving the couple being blindfolded and assailed by much incomprehensible chanting. The audience was left puzzled rather than uneasy, the island unfamiliar and threatening, so Adrian’s comment that the island is “uninhabitable, and almost inaccessible”, certainly fitted with the Arctic setting. Among the sources for the imaginary island, though not documented, must be stories of voyages to far-off places which would have been brought back to England by travellers. Not all voyages were to the south, east or west. English explorers were also travelling north. The islands of Jan Mayen, off Greenland, and Spitsbergen, far north of Norway, were discovered during Shakespeare’s lifetime and both were visited by English explorers around 1607. 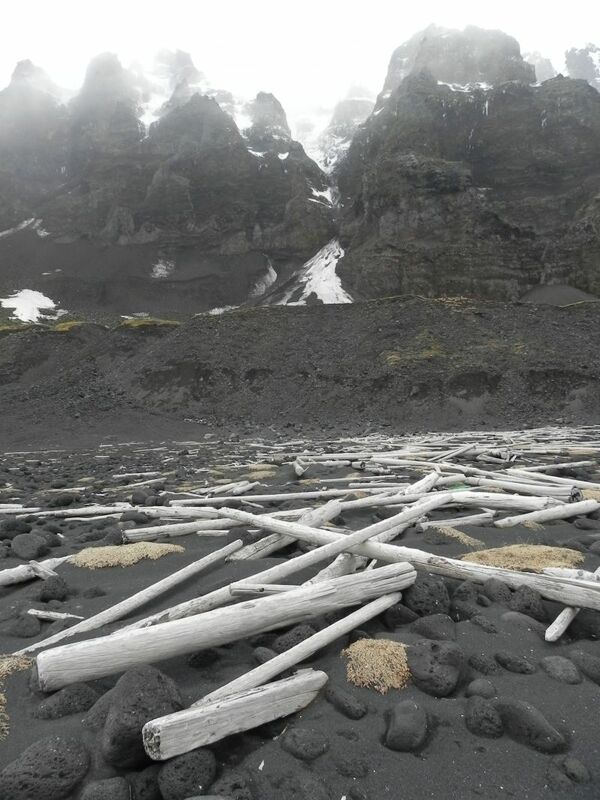 Jan Mayen is a desolate place, dominated by a huge active volcano, the land black as a result of the latest eruption with glaciers stretching down to the sea shore. Spitsbergen is a land of snow and huge jagged mountains, so far north that in the summer the sun never sets, followed by months of perpetual night in winter. Is it fanciful to think that Shakespeare heard about these islands, and incorporated stories about them into his imaginary isle of The Tempest? I recently spent a wonderful day researching the early history of whaling at the Scott Polar Institute Library in Cambridge and in a further post I’ll be writing more about the adventures of English sailors in the far north. 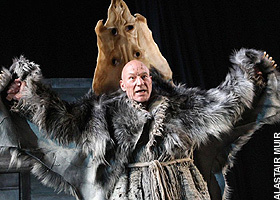 This entry was posted in Plays and Poems, Shakespeare's World and tagged Arctic, exploration, Jan Mayen, Rupert Goold, Scott Polar Institute Cambridge, Shakespeare, Spitsbergen, The Tempest, whaling. Bookmark the permalink. You’ll have to read my follow-up piece, which will probably be about a week as I have so much information to digest. 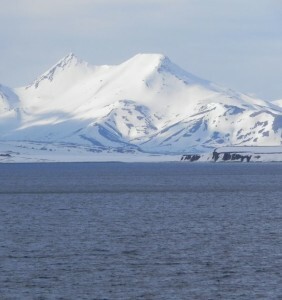 My interest in whaling was sparked by my visit to Jan Mayen and Spitsbergen in 2010. I had no idea about the extent of English involvement there, and I was fascinated to find that they were some of the first whalers. The Scott Polar Institute Library is quite wonderful, and I’m already thinking about a return trip! The first version I ever saw of The Tempest was Derek Jarman’s 1979 film. At the time I found it bleak and incomprehensible but the more I understand of the play the more highly I rate Jarman’s interpretation of it. Like Goold’s, Jarman’s island is lonely and inhospitable, there’s just Prospero, Miranda and Caliban stuck there alone, plus a miserable and resentful Ariel, all refugees (Caliban was born there but only because Sycorax was driven from her home) and all of them, including Caliban, are glad to get the hell out of it as soon as the shipwrecked mariners come ashore. Thanks for your comment Andrew. I saw the Jarman film when it first came out and thought it was the most boring and self-indulgent film I’d ever seen. I remember one of the actors talking about how they’d cut the text because Shakespeare went on so long, which seemed hilarious as the resulting film was so dreary. The singing of “Stormy Weather” at the end confirmed for me that the director had run out of ideas. I’d probably find more in it now if I was to watch it again but I’m not sure I can be bothered. Thank you for reminding me of it nevertheless! One of the great themes of this play is spectacle, magic, an island, spirits, music, a devil son, hell hounds, etc. The island is the hooking spectacle! With it the whole theme of spectacle and magic is set, there is something magical and spectacular about a ship wreck and an island. Put that island in the middle of the frozen north–not so much! For the audience it looses it enchanting luster and is just a heck hole. It looses its bang and its purpose of spectalce! Hi Chris, I think maybe we’re all rather seduced by the idea of a magical island having to be tropical! Spitsbergen and other places like Iceland are amazing places and Shakespeare’s pretty vague about what the island’s like, if you look carefully at the text.